I was talking earlier to a dear customer, and went and revisited my gallery of Wee Babies. I was amazed to see so many, and to see their evolution in the short few years I have been making them. One of the wonderful things about my doll making journey is revisiting the path travelled. I can see these photos, and remember what was going on in my life when I made all those little dolls. I can remember the thoughts that were going through my head as I changed the ears on this one or that one, as I made a more protruding belly, as I almost screamed with excitement when somebody gave me a white angora sweater and had visions of buttercup bunnies. It is a beautiful thing to be able to revisit my life, my triumphs, my dismays by going over the work I have created. To see how my work has evolved fills me with so much pride. 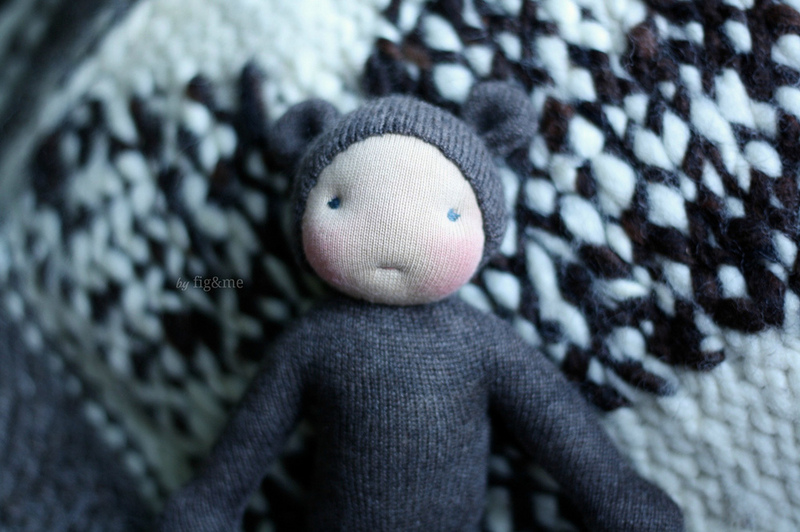 When my mom was here and I was trying to teach her how to make this particular kind of doll, she was asking why do I do things this way or that way, and it just kept flooding my head of the particular instances in which I discovered that exact technique or when I made that decision. Much of my life is a puddle of ignorance, I have to confess, and I work more with eagerness and ingenuity than with deep knowledge and certainty. Things just spill out of me, I just want to create them and how to make them happens as I am crafting. There is of course an element of planning and design, of sketching and figuring things out, but most of the time is on the work table where I make my discoveries. It feels like such an adventure!. I suppose is the same for everybody out there, creating with their hands and hearts. Wether you paint, sculpt or work with a sewing machine, to be able to see your journey behind you is something you can't help but smile. Smile a lot. *all these photos are of Wee Babies made in the past, do not get your hopes up of them being available for sale. Sorry!